If you ever saw a pressure washer in action, you have certainly wondered is it worth to get one. They are powerful, multi-functional, and, above all, fun. There are various types out there (subtypes even), but the general purpose of a pressure washer is to clean those nasty grimy stains that a regular hose can’t even scratch. We, at Pressure Washer Lab, dedicated the time to get to know these machines inside out. After all, we think that any household can benefit from a pressure washer of some sort, so getting to know these powerful, yet delicate machines are essential. Believe it or not, there are some top-notch tech solutions installed, and they are worth mentioning. So, what kind of cleaning strength awaits, and will you finally be able to clean like a pro? Stay awhile and find out! It takes a lot for a pressure washer to be the best. Even though it might seem logical to slap on the strongest engine/motor on the longest hose out there, things are not quite that simple. For a pressure washer to be the best, specifications need to be balanced. So, an all-round washer needs to have a couple of things in check to fall into the group of best pressure washers. Power – This machine needs to have enough power to help you clean a wide variety of dirt and dirty surfaces. From simple tasks like cleaning the dirt and dust from your patio stairs to heavy-duty ones such as destroying the rust from a grill grate, or cleaning the driveway. Portability – The ease with which you can maneuver around the yard is as important as power is, no doubt about it. The key to having a portable washer, without it losing its power, is in the compact technology built inside. One of the safest ways to check is to compare PSI/GPM rating with the weight of the model. Of course, additional carrying mechanism (like a 2-wheel system) are always welcome. Ergonomic equipment – Even though this goes without saying when it comes to tools, pressure washers rely on some of the ergonomic solutions that come along. There is much to the way of how the hose is packed, what material is the handle made of, and how easy it is to adjust the spray nozzles. Every little thing counts. Portable pressure washers are the best tools when it comes to cramped spaces. They are reliable in the case you have to reach for that driveway corner that is far away, and you cannot afford to haul a large gas-guzzling machine. They are known for being compact and resourceful. Let’s face it, not everyone needs a large (and often loud) device around their home when cleaning is in order, so the manufacturers that make portable pressure washers thought of noise too. If you want to have an occasional cleaning session, with some light stains, portable pressure washers might be right up your alley. They are small and lightweight, ranging from 9 to about 30 pounds per model. And despite their smaller frames, they often have wheels to help you maneuver around the premises easily. The most popular tasks that portable pressure washers are designed to tackle are patio cleaning, sidewalk maintenance, car washing, outdoor furniture cleaning, etc. As you can see, there’s a wide variety range included, as long as you do not need to approach a nasty old stain. It is true that portable washers lack in power when compared to their bigger counterparts. However, what they lack in power, they make up in convenience. Cordless operation – Some models have rechargeable batteries and allow you to carry them around freely. They are not that powerful but will enable you to reach the most difficult places. Canister water source – For the jobs that do not require a lot of water, or in the case there’s no water hose input available, there are models with detachable canisters. And, do not worry, less water does not mean less power. You will just have to refill. Often considered the bulkiest, gas pressure washers are known for packing a serious kick. But with great power, comes some more weight than the electric models. And it comes as a no surprise, since gas pressure washers draw the power from an internal combustion engine, and not an electric motor. What this means is that every rule regarding engines applies here as well, including oil change and gas refills. The bread and butter of gas pressure washers is their ability to cover a large area with no need for an electrical outlet. They are medium-to-heavy-duty and are packed into big, solid frames which are usually mounted on a 2-wheel system for greater portability. Considering this, they are often the first choice of people with larger backyards. Another great use for a gas machine of this type is cleaning old stains off of driveways or any stone/metal surface you have around your house. Some models are even strong enough to remove layers of paint. 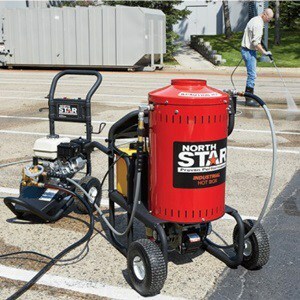 Due to their power and a wide range of coverage, gas pressure washers found their place in rural areas, and sometimes even industrial and construction yards. They are best used in widely-open spaces due to the exhaust gases and slightly-higher than average noise levels. Because of the massive size, and heavier frames, manufacturers add convenient things like hose and nozzle holders, oil and fuel indicators and multiple heavy-duty handles. All in all, if you have a lot of outdoor cleaning to do, gas pressure washers are up for the job! If you are looking for some power, and you do not want to include gas, there are powerful electric pressure washers to fill that need too. Even though it’s logical to assume that electric appliances cannot exert a lot, the technology of today would surprise you. And thanks to those tech solutions, the electrical motors inside these machines produce heavy-duty results, thus making them the most powerful electric pressure washers. The absence of an engine (and the tank that follows it) made a lot of room for accessories and extra features, while simultaneously reducing the average weight. Concrete cleaning, patio maintenance, graffiti removal, and even pool washing is fair game for these pressure washers. They are corded, yes, but the makers made sure that these cords are long enough to help you reach 30 or more ft in diameter. To add some more to the convenience of using them, some models have a noise muffling system, which enables you to clean even during night hours. Powerful electric pressure washers are convenient to use and to maintain, and carrying them around should not be that difficult, except for some heftier models. The majority of choices out there comes with a wheel system of some sorts, to help you haul them around the surfaces you want to clean. Additionally, powerful electric pressure washers are always equipped with different gear that can help you adapt to various tasks. This includes adjustable exerts speeds, different angle nozzles and much, much more. Sun Joe is one of the best premium and well-known brands when it comes to manufacturing top-quality pressure washers. They are efficient in not only creating some of the most eco-friendly and power-saving washers, but they also provide great after-sales services in general. The pressure washers are made to be extremely powerful; usually providing a high-pressure rate at 2000+ psi. They come with a full 2-year warranty for almost all of their products. You can rest assured that your product is completely warranted and can be used without issues. As you can see in our Sun Joe pressure washer reviews, it is an award-winning multinational company that has numerous certifications, approvals, and awards for their high-pressure washers. 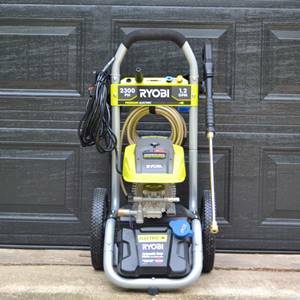 Ryobi Tools is another company that aims to deliver its best when it comes to providing the premium tools, whether it be pressure washers or other cleaning tools. 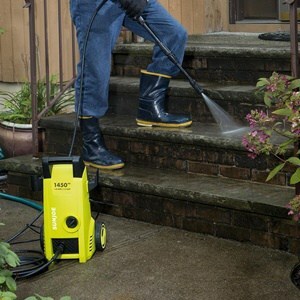 Ryobi’s pressure washers are easily portable due to their smart design and overall exterior. They also boast a high powered motor which helps produce great pressure; this, in turn, helps largely with the cleaning action. Their innovative design helps them strive in the market and keep the customers engaged. Their products are all warranted to some degree and their customer services are average when compared to others. However, their price points are commendable. Karcher is a globally recognized German company which manufactures high-quality pressure washers. Alfred Karcher was the founder of this family-owned company. He was a great inventor who introduced the first pressure washer in 1950. His invention proved to be highly future-oriented, so much so that it still serves the purpose of accomplishing challenging cleaning tasks. The brand Karcher is known all over the world for high performing cleaning equipment. Since 1950, Karcher has carved its name in the cleaning industry for producing innovative and strong power washers. Karcher offers a wide range of gas and electric pressure washers you can choose from. Karcher pressure washers provide better cleaning performances but at a higher price. You will be able to replace the accessories of the pressure washer easily once they wear off. 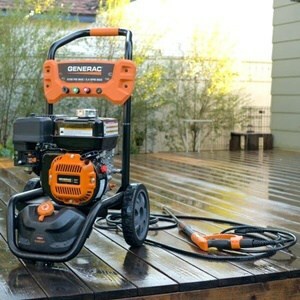 Generac is a brand which is famous for producing portable generators since 1959. In 2007, this American company diversified its product range by introducing strong and sturdy pressure washers. Keeping in mind the cleanliness requirements of the customers, Generac offers pressure washers with a variety of output pressures. You are able to control the pressure of the water and have the power of 4 pressure washers in 1. 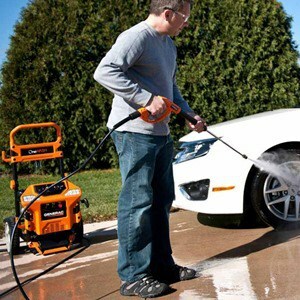 Whether you want to clean your patio or blast away the dirt from your driveway, Generac provides optimal cleaning power. Generac manufactures solid medium-duty to heavy-duty pressure washers. You are even able to perform the heavy-duty power washing tasks like concrete and gutter cleaning. Generac pressure washers are backed by good warranty policies. For a company that has an experience of over 50 years, Simpson manufactures reliable and durable pressure washers. Simpson pays attention to detail and believes in producing world-class pressure washers that can meet the needs of its customers. Get rid of the dirt and grime from the toughest surfaces with Simpson. This brand offers a wide range of pressure washers with different PSI and GPM. You can choose the one which will suit your cleaning needs the best. Also, these pressure washers simplify your cleaning chores and allow you to save your time and work smart, not hard. Simpson pressure washers are built to last for years to come. They also come with industry-leading warranties. Greenworks was founded in Canada by Yin Chen in 2002. It is a leading pressure washer manufacturer which is known for producing affordable and long-lasting outdoor power equipment. 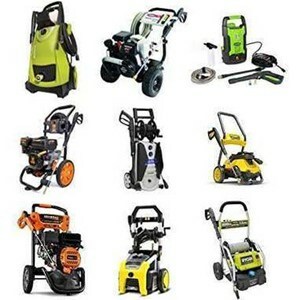 They provide high-quality lawn mowers, blowers, cordless drills, and other garden and outdoor equipment, apart from their pressure washers. The company is present all over the world. Millions of people use Greenworks pressure washers to blast away the stubborn stains from the dirty surfaces. They produce highly versatile pressure washers which give you the flexibility to carry out varies cleaning chores. Utilizing the full potential of a pressure washer can be a time saver. Besides, they are known to be quite green, and save a lot of water, despite the pressure which pumps it out of the nozzle. We were amazed by how efficient they are, and how little resources they use, both smaller and larger units included. It is true that there are a lot of models out there, and the choices are plenty, but as long as you decide on the type you need, the search will be a lot easier. You will forget your regular garden hose as soon as you are finished using the pressure washer for the first time. It is a unique and empowering experience, not to mention the satisfaction of bringing the shine out of your sidewalk after years, or even decades. Pressure washers are not for professionals only anymore, and they are available to anyone. Let the rejuvenation of your yard begin!